Drive up to this home situated back on a large lot, and fall in love immediately with all it has to offer. As you enter into the large open floor plan, you see this home is great for entertaining. Also offering great possibility for multi-generational living as there is one full bath and two bedrooms on the south side of the house, and an additional two bedrooms and two full bathrooms on the north side of home. Both of these bedrooms on the north side can serve as master bedrooms as they have an adjoined bathroom. The home also offers an additional large family room area with a large brick fireplace. A great mix between old and new, it allows for great opportunity to make it your own. There is a tiled sunroom off the kitchen and family room where you can host company or enjoy an morning cup of coffee. The back yard also has a small courtyard area that has a great view of the nearby mountains. The detached garage has an unfinished bathroom that lends toward future building opportunities and the space for multi-purposes use. The deep lot goes beyond the garage can be room for a play area, additional parking, pool, shed, the possibilities are endless. 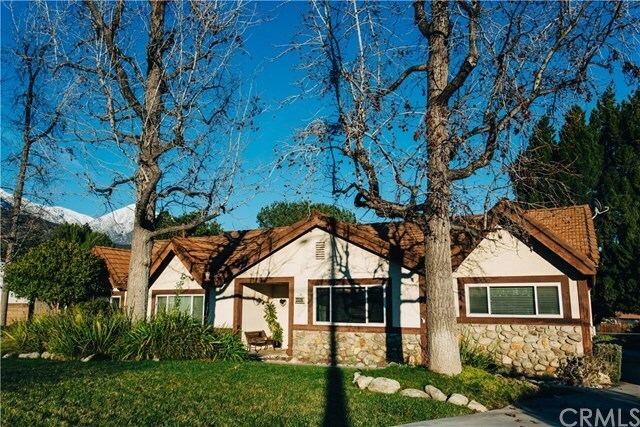 Don't miss the great opportunity to own in North Upland!